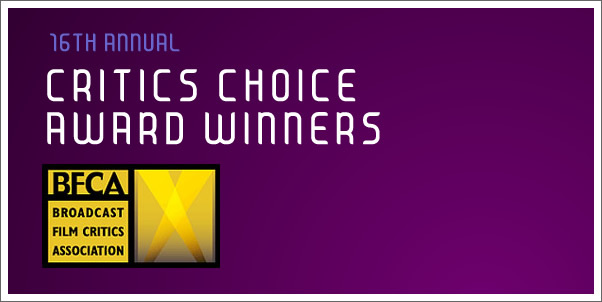 In case you missed it last night, The Broadcast Film Critics Association's annual film awards were handed out last night at the CRITICS CHOICE AWARDS aired on VH1. The big winners, as one might have guessed, were THE FIGHTER, THE SOCIAL NETWORK, and INCEPTION. While INCEPTION bagged six total awards, glaringly missing from them was the Best Score award, which most devastatingly went to TRENT REZNOR AND ATTICUS ROSS for THE SOCIAL NETWORK. While I offer up congrats to the duo, I am starting to tremble all the more as wins like this will only hasten the trend of more artists from other genres coming into the original score genre and delivering disappointing, albeit unique, experiences like THE SOCIAL NETWORK. Of course, this movement is well under way with this same duo being linked to the remake of THE GIRL WITH DRAGON TATOO (the original film taking home the Critics Choice Award for Best Foreign Film), with DAFT PUNK in TRON LEGACY, and with THE CHEMICAL BROTHERS doing the upcoming HANNA.